Like Samsung’s Multi Window, LG has a dual-app feature in its phones called Dual Window. Dual Window allows you to run two apps simultaneously on top of one another in resizable windows. You could do things like continue a Hangouts conversation while grabbing directions to your friend’s location. You could watch a YouTube video for an artist while sending an email about their upcoming concert that you would like to attend. Dual Window, like Multi Window, is a multi-tasker’s dream feature. 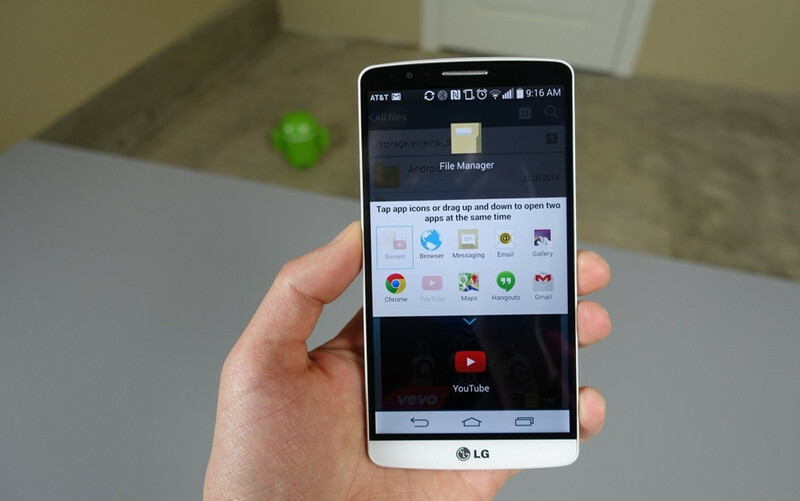 With LG’s version on the G3, you get a less-feature-packed Multi Window. There are less apps that can be used when compared to Samsung’s take on multiple windows, plus it is quite slow and laggy, even with the ultra-powerful Snapdragon 801 processor powering the G3. With that said, it does have uses, a couple of which I mentioned above. As far as the app list goes, you only have access in Dual Window to the stock browser, Chrome, Messaging, Email, Gallery, YouTube, Maps, Hangouts, Gmail, File Manager, and AT&T’s Locker. There are options for transposing the windows being used, to maximize one, to close them individually, or to manually resize each. There is a recent button that allows you to quickly pop up your last combo of apps, along with two shortcuts to quickly launch Dual Window (long-press Back, or open the app switcher and then tap the “Dual Window” button). To see Dual Window in action, hit up the clip below.